With a long-standing reputation for quality, innovation, reliability and exceptional service, Hobart prides itself on listening to its customers and developing products that have been evolved to meet their needs. Providing the most comprehensive and technologically advanced range on the market, Hobart is the Natural Selection for caterers across every sector of the industry. Hobart prides itself on being the world leader in warewashing development and offers highly specified products which are supported by the very best after-sales service in the industry. Hobart warewashers are designed and built as a result of extensive customer research, benchmark testing and innovative technological applications. Hobart provides a full range of energy-saving warewash solutions, setting new standards in terms of economy and consumption across the board. Bonnet – the flagship brand of Hobart cooking – is popular worldwide because of its heritage within the culinary world, reputation for quality, robustness and excellent after-sales support. Bonnet is renowned for using its wealth of knowledge and expertise to design and create working stations that meet the needs of the individual and it is the suite of choice for many top establishments and high-profile chefs. Hobart Service works with all makes and models of catering equipment and offers three levels of programmes; Plus, Extra and Max, with a range of benefits. 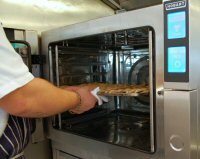 Hobart is able to offer local service on a national basis – providing one point of contact for the whole kitchen with personal access to over 200 company employed technicians, whose expertise guarantees downtime is decreased and a 93% first time fix is achieved. Hobart is committed to continuously designing and building quality equipment that delivers unique benefits in terms of performance whilst also saving on limited global resources.